No problem. Anything with Wanda in it is awesome. Well it's true! And Blink is awesome as well, though I'm not sure how much I like the pigtail look. i didnt even notice them! haha. They're there. Too bad Marvel cancelled the book, I really would have liked to see where all of this new Exiles business was headed. Well it is our random topic. 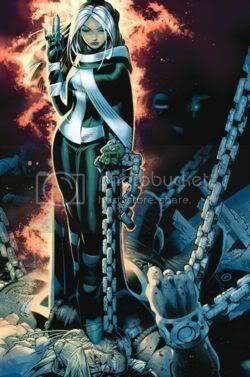 Speaking of random, I would have liked to gave seen this outfit be one of Rogue's alternates for one of the Legends games. Really? That other link that you couldn't see didn't work for me, but this one is. thats actually a good idea. i like both outfits...isnt the second one wat they wanted to do if she was n evo? Yup and I really like the concept of that outfit a lot. Do you need any additional help with the game? I'm playing and talking to you so it's the perfect time to ask. Really? I'm already done with Cyke's "personal mission", the first tour in the Astral Plane and I'm currently in my second tour around the Morlock Tunnels. ya..i havent played in like 2 days tho:P im gonna try today. If you need any help, give me a hollar. k, so i played the game and i gave up. i keep dying, there r no extraction points, and way to many people. its so annoying. i think i might start another legends 2 game. do u have legends 2?